Gambrel Restrainer is the easy and simple way to restrain and hold sheep. 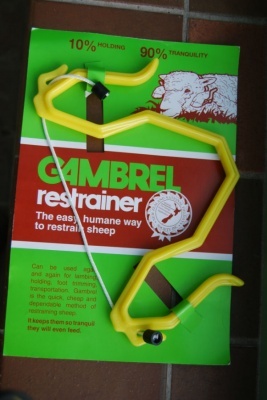 It is an essential aid for lambing, holding, foot trimming, transporting and during treatment. Easy to use and quick to fit. 10% Holding , 90% tranquillity, it keeps them so tranquil they will even feed. The easy , humane way to restrain stock.